The typical wedding day consists of several events that are each uniquely captured by the photographer. 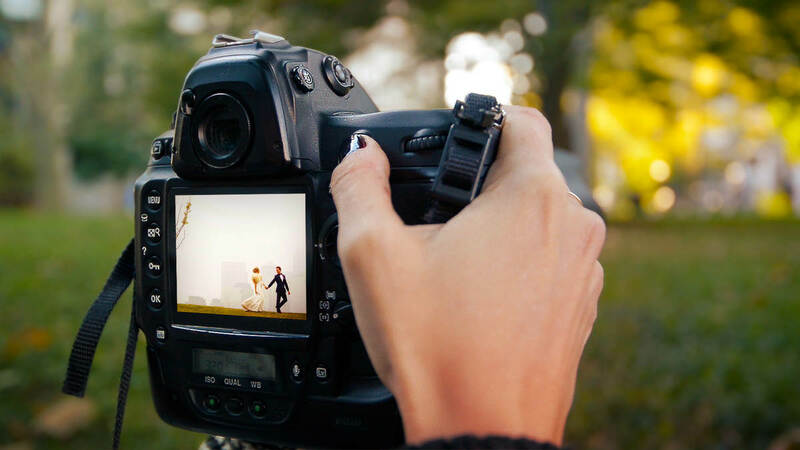 The camera settings used on a wedding are always changing, but there are a few predictable moments on each wedding day that have suitable corresponding camera settings. The morning preparations usually happen before 11am. At this time, the morning sun is peaking through windows and there is great natural light available. This part of the shoot might take place in a hotel room, where the sources of light can include lamps or ceiling lights as well as the large windows usually found in hotel living rooms. It could also take place at the bride and groom’s homes. It is here that the photographer will usually shoot the wedding dress, rings, and other details that might include the bride’s shoes or the groom’s watch. The light available at this time allows for a low ISO to be used, as well as fast shutter speeds. The events taking place now, like makeup being done and the outfits being put on, can be photographed beside the largest window available, making use of the natural light available. In terms of white balance, daylight is the most likely, unless there are bright lights inside the house or hotel room, in which case a mixed colour temperature balance of approximately 4400K would be required. The close-ups being photographed now, like jewelry, makeup and hairstyling, and clothing, might require a macro lens or a long lens to be used by the photographer. After the morning preparations, the outdoor park shoot gives the photographer another opportunity to use natural light to keep ISO low on the camera, and the shutter speed high. This will result in the least noise possible in the images, as well as allow for the capture of motion without blur. This shoot will include a posed photo session along with candid shots. For the posed shots a lower shutter speed might work, but for candid snapshots of any excited wedding party members moving fast, a fast shutter speed will be needed to capture them sharply. In terms of white balance, daylight (5600K) seems most likely here. In cloudy or shaded areas, the daylight balance would appear cold and blue, so 6000K or higher might be needed. Coming to the reception, the camera settings will have to change again as the photographer prepares to deal with a lower amount of light. If the reception is outside, the same settings from the park shoot apply, but coming into an interior lit with light bulbs, the photographer needs to find the correct white balance. 3200K is common for tungsten bulbs, that appear yellow to the eye. Other, more orange looking bulbs may be even warmer, at 2900 or 3000K. CFL and fluorescent bulbs are also commonly used, and they produce a colder light, around 4400K or even matching daylight at 5600K. The problem with these CFL and fluorescent bulbs is that they will look a bit green on camera. The photographer will have to adjust to the different kinds of bulbs found in the reception location, and also increase ISO to compensate for the lower light levels. Finally, the banquet hall is similarly lit to the reception location, with a variety of light bulbs of different colour temperatures. The main problem for the photographer here will be low light once the lights are turned down for dancing. This can be compensated for by the photographer using either continuous lights or flash as additional lighting. This will allow them to keep the ISO low on the camera and keep the wedding looking sharp and clean even in the dark.